Many of you would be aware of the issue that existed during 2017 with the NSW Civil and Administrative Tribunal (NCAT) and its inability to hear and determine matters between parties residing in different states of Australia due to federal constitutional law. On 1 December 2017 the Justice Legislation Amendment Act (No 2) 2017 commenced and its introduction dealt with the issue. Updated information and a fact sheet has been released by NCAT which provides more detail on the issue, the changes and what they mean. “Diversity jurisdiction” only affects where the party residing interstate is a natural person. There is no issue if the party is a corporation, NSW Government, a non-permanent resident of the other state or a resident of a territory. If a party resides in the ACT or NT, they are not affected. As the Act only provides NCAT with jurisdiction, all claims must be lodged with NCAT in the first instance. NCAT will attempt to resolve through an agreed settlement. If no settlement or, a settlement requires enforcement, the claim will need to go to the Local or District Court depending on the amount claimed. NCAT will provide a letter to the claimant and a copy of the claim lodged with it. The claimant then needs to attend their nearest court to complete a court summons and affidavit. There are no additional lodgement fees unless the claim is substantially changed from what was originally lodged with NCAT. Parties can continue to represent themselves. 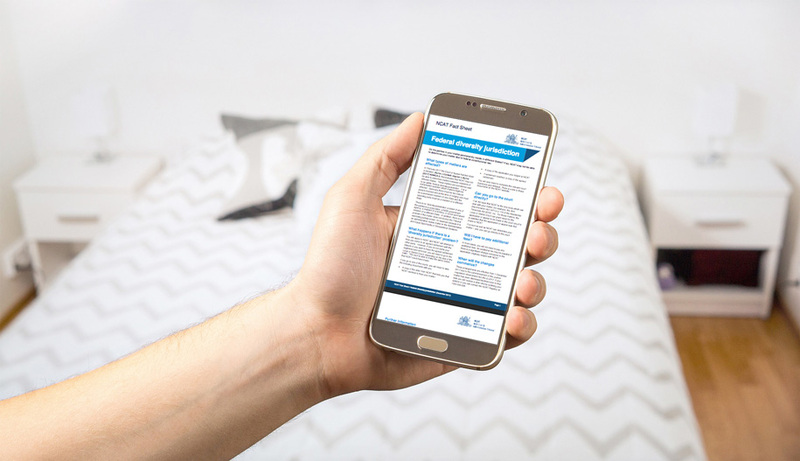 We have updated our Residential Tenancy Agreement to include a checkbox for this information and have suggested to NSW Fair Trading that they update the New Tenant Checklist as we believe that the tenant should know this information when beginning the tenancy. EAC has been advised by NSW Fair Trading that there are around 200 matters (across a range of matters, Australian Consumer Law, anti-discrimination, residential tenancy) that have been declined or dismissed and NCAT will write to the parties advising of the option now available. If you experience any issues as the new process is implemented please let EAC know so we can pass on the feedback to NSW Fair Trading and NCAT directly.